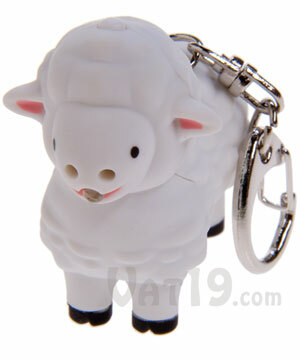 These Farm Animal keyrings are not only cute, but functional. They either quack, oink, hoot, moo or baa when you press the button on its side or head! No, wait, that's the cute part. 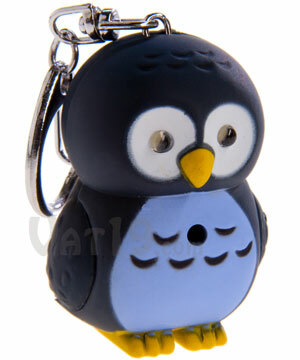 The functional part is that when you press that button, the animal shines a light from either its eyes, mouth, or nose. That way, you can light up the lock when trying to open a door at night. Very quacktastic! 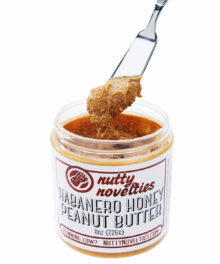 (Ok, that was lame and not at all oink-riffic, moo-pendous, hoot-rageous, or baa-credible). 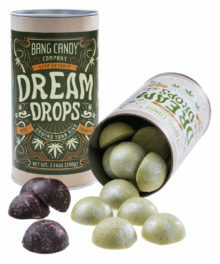 I'm an impulse item, so bring me home today! 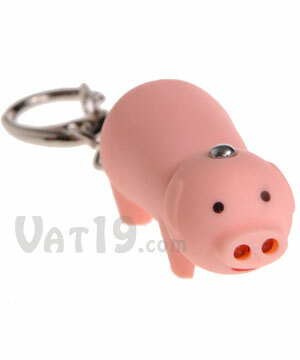 Farm Animal LED Keychains are cute little plastic toys that will probably never see a pond, mud pit, or pasture. But, that's okay! Each of these farm animals is more than happy to spend its life hanging out with your house key, car key, and gym locker key (like that gets used a lot!). Of course, when you're faced with a dark parking lot or a burned out porch light, your Farm Animal Keychains come to the rescue. Press the button on his wing or head and he shines a light from his beak, snout, mouth, eyes, or nose. 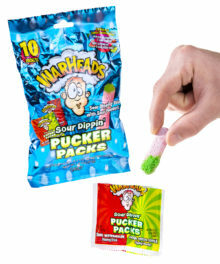 This is also accompanied by a quack, snort, baa, hoot, or moo. 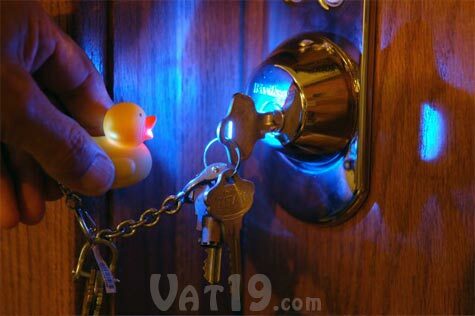 The Duckie Keyring illuminates darkened locks. Hooting, quacking, oinking, oh my! 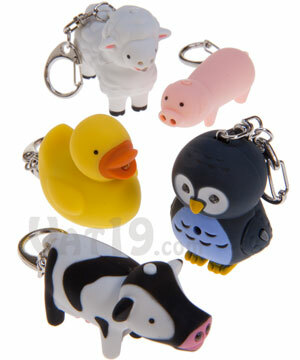 Each Farm Animal Keychain makes its associated "sound" when you press its button. The duck quacks, the owl hoots, and so forth. 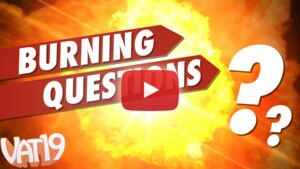 Check out the short demo video below to see each animal in all its mooing, oinking, and baaing glory. Watch this demo of the Farm Animal Keychains. 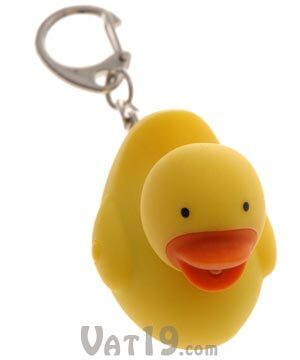 Seriously, every Sheep, Owl, Piggy, Duckie, and Bessie needs a keychain to call home. They will never talk back and they're housebroken. 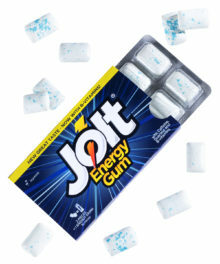 Get all five today! 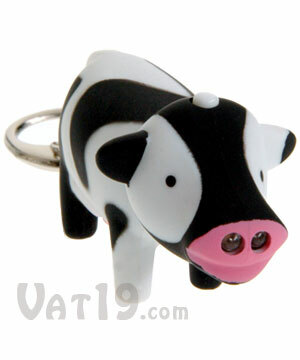 Farm Animal LED Keychains are available in several animal styles: baa-ers, hooters, oinkers, quackers, and mooers.